Australia is uplisting the leatherback turtle to the endangered category due to the ongoing threats the turtle faces from unsustainable harvesting of egg and meat and pressures from commercial fishing outside Australian waters. 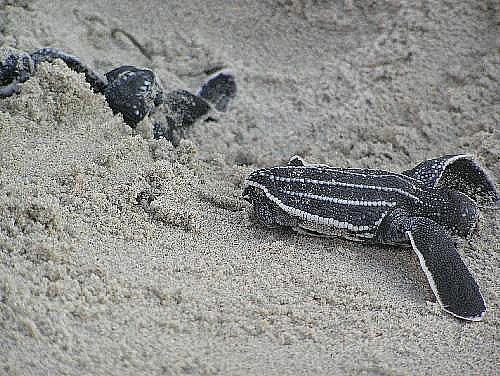 Leatherback sea turtle hatchlings heading for the ocean. "With warmer temperatures and changing climatic conditions increasing the pressure on water availability, ecological communities such as this must be protected," Mr Garrett said. He had also uplisted the world's largest sea turtle, the leatherback turtle, from vulnerable to endangered. Leatherback adults average around 1.6 metres in length and weigh from around 250 to 700 kilograms, and are found in tropical and temperate waters around Australia off the south Queensland and New South Wales coasts and off Western Australia's coast, south of Geraldton. Mr Garrett said the Australian government was currently reviewing the Recovery Plan for Marine Turtles in Australia, and where appropriate, the revised plan would include more stringent measures to reflect the changes to the turtle's conservation status.